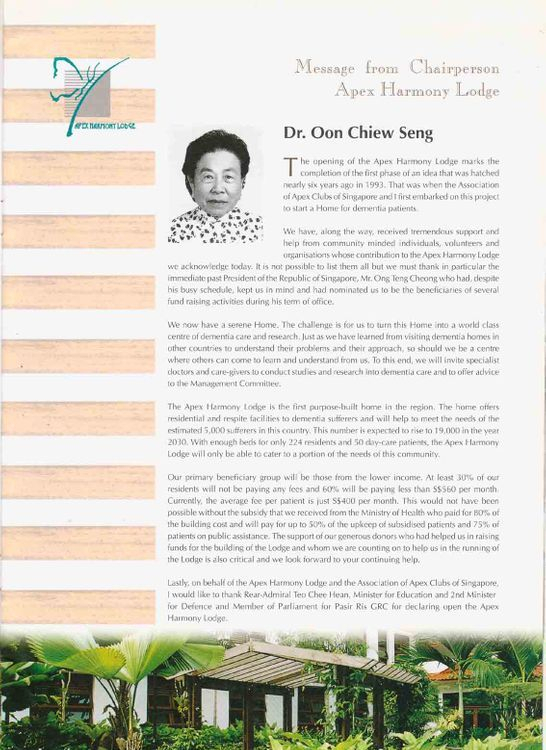 Apex Harmony Lodge is one of the two national level projects undertaken by Apex Club of Singapore. 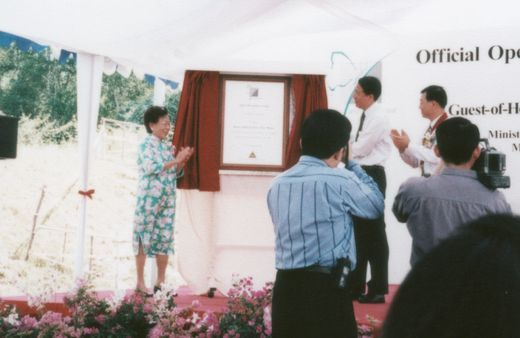 The Apex Harmony Lodge was registered in 1995 as Singapore first purpose-built home for people with dementia. 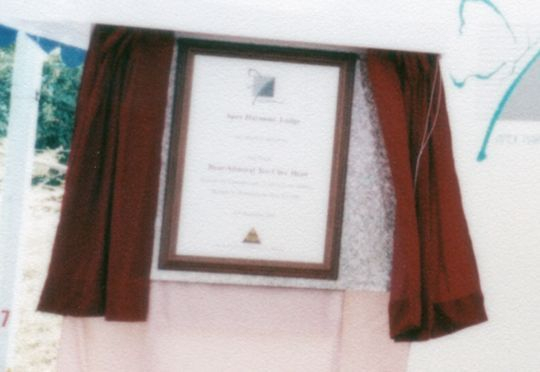 Opened in Nov 1999, the Lodge is a pioneer in providing patients suffering from dementia, a high level of healthcare. 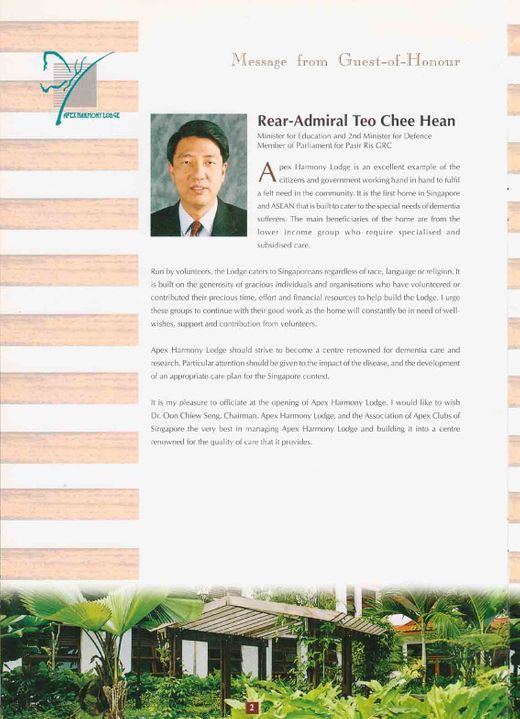 Set in 60,000 sq feet of land in Pasir Ris, it can cater to more than 200 residents and 50 day care patients. 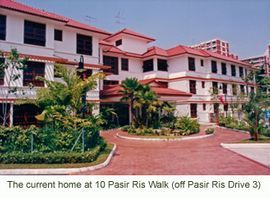 The large open-concept design of the tropical style building and lush landscaped gardens and courtyards are self-enclosed, providing a home-like yet secure environment. 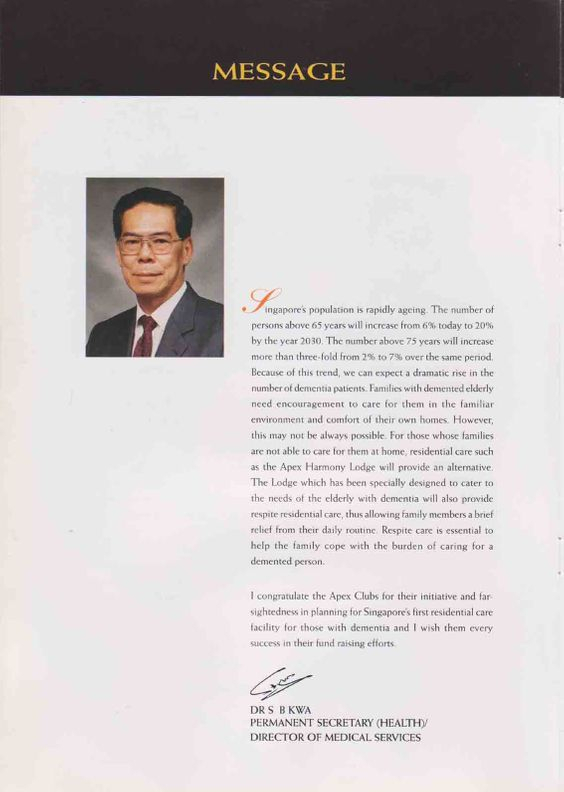 Apex Club has played a significant home towards building the home, providing its members to be part of its Management Committee and helping to raise funds to build the home. 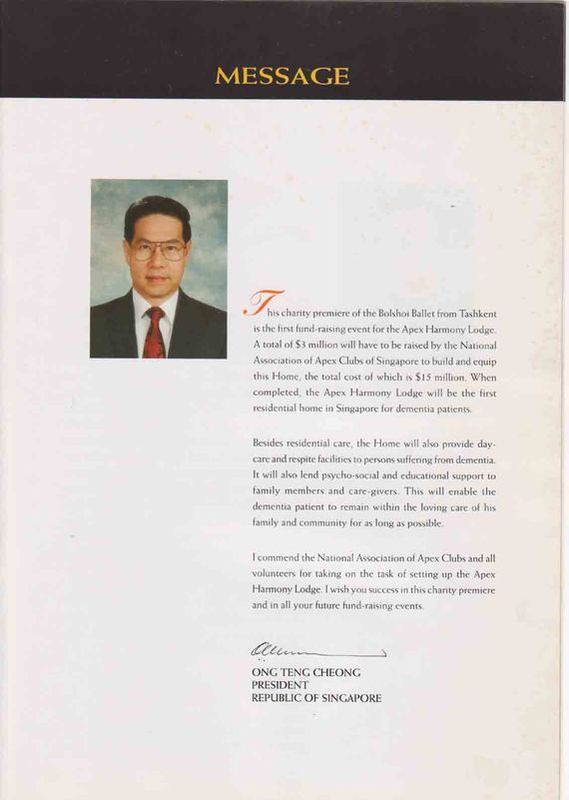 The first fund raising event for Apex Harmony Lodge was to organize the charity premiere of the Bolshoi Ballet to a tune of $3 million. 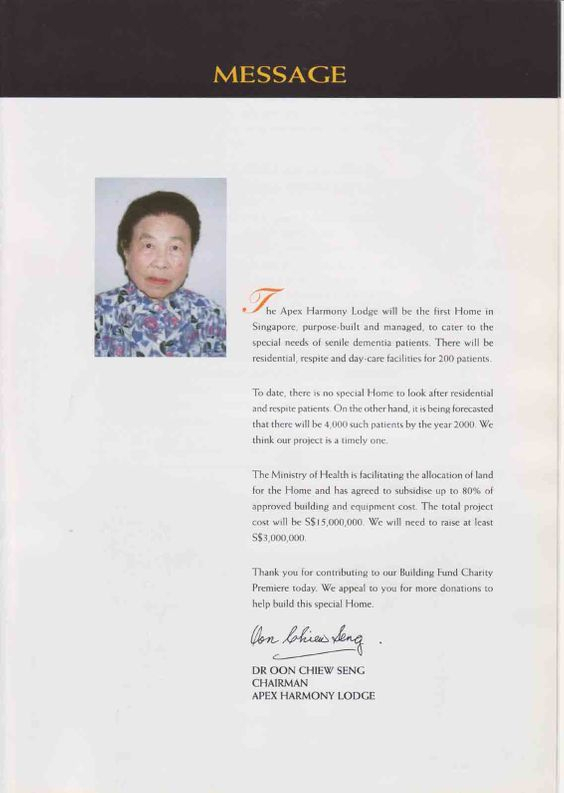 Other building fund projects also included a Chinese Calligraphy Exhibition. From just an idea, to the actual building of the Home and after its official opening in 1999, Apex Club has been part of this facility, working hand in hand with Dr. Oon and other volunteers to raise funds and provide fun-filled activities and social support towards the well-being of its patients. 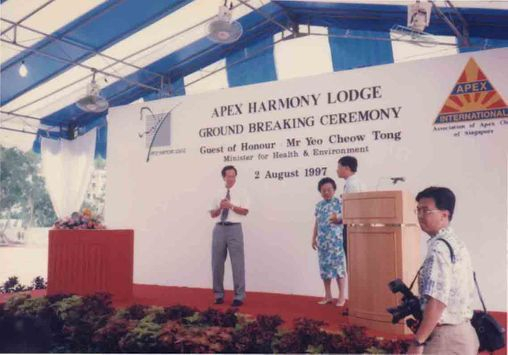 Apex Club has helped to run Flag Day event to raise funds for the Apex Harmony Lodge too. These include providing logistical support of co-ordinating with schools to get students to solicit for funds, collecting back the tins, coin sorting and tallying up the collection. 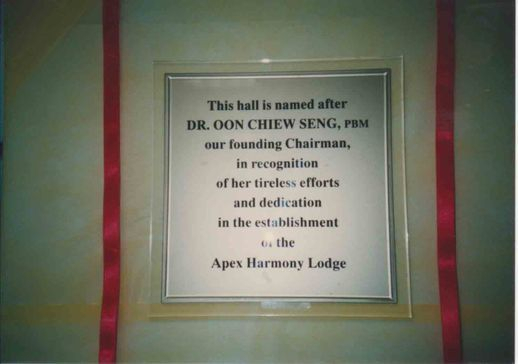 Apexians are still actively involved in Apex Harmony Lodge, both as Individual membership as well as Institutional membership whereby all our three branch clubs, Apex Club of Bukit Timah, City Club as well as Radin Mas clubs are represented in Apex Harmony Lodge’s board. 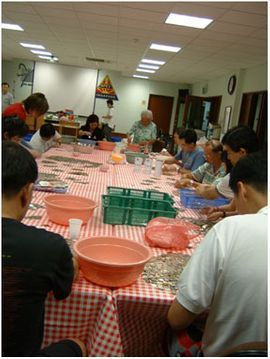 Left (photo): Counting of flag- day collection money by our members.